The German Autobahn are famous because they are some of the few public roads in the world without blanket speed limits for cars and motorcycles. Lack of blanket speed limits does not appear to negatively impact the road safety of Autobahn compared with motorways in other countries; motorways are safer than other road types. Perhaps this is in part because traffic can be heavy enough to restrict speeds to little above the typical motorway speeds found elsewhere, or due to reducing the exhaustion of the drivers by shortening their travelling times. Just like all European motorways, the Autobahn have multiple lanes of traffic in each direction, separated by a barrier with grade-separated junctions and access restricted to certain types of vehicles only. For German and Austrian autobahns only accept motor vehicles that can obtain a speed of at least 60 km/h (37 mph). For Swiss autobahns the vehicles must be able to obtain a speed of at least 80 km/h (50 mph). In most countries, "Autobahn" usually refers to the German autobahn specifically. The German Autobahn network is approximately 12.000 kilometers (7 565 miles) long. The third in the world after United States and China. Also take in consideration the land area of USA is more than 25 times Germany. China is about the same size as United States. With this taken into account, the US ought to have approximately 1.8 million kilometers (1.1 million miles) of motorways to match Germany. The numbers above is a little misleading because the differences between European and American standards in what classifies a Motorway. 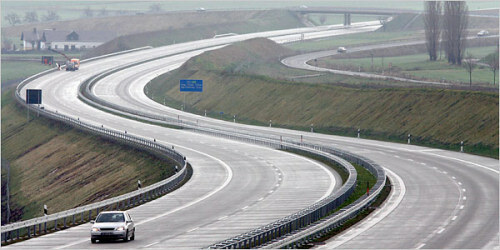 In United States there are many names for "Autobahn" (Highway, Interstate, Freeway, Turnpike etc.). Motorway-like roads in USA which allow pedestrians and bicycles would not be classified as Motorway in Europe, but are counted for in the statistics above. They would certainly not be classified as Autobahn in Germany.